At the end of every month, I like to take stock of where things stand with respect to re-qualifying for airline and hotel elite status. My top programs are United and Starwood - so where do I stand 1 month into the year? 1,212 Premier-Qualifying miles on United. No - I'm not missing a 0 or anything like that. This year has been really, really slow in terms of travel so far. For comparison purposes, by this time last year I was already at 26,441 and had already re-qualified for Silver status. I do have ~65,000 PQMs planned from now through the end of the summer, so that will put me in better shape. The end of the year is shaping up to be really slow though - I plan on stretching (if necessary) to hit Platinum status, but sadly I don't think it's in the cards for me to re-qualify for 1K. Things are looking better on Starwood, primarily due to the 5 nights I spent at the Westin Cape Town to start off the year. Well... it was only a matter of time. Yes folks, it looks like it's time for another points / miles-earning scheme to come to a close. Lifehacker (and by extension US News) has just shared how to "Get Cash Back (or Rewards) for Free by Buying Vanilla Reload Cards". It's now only a matter of time before a major mainstream media outlet picks it up (think WSJ or NYTimes), and then it's only a matter of time until the "loophole" gets shutdown, just like the now-infamous US Mint deal did. I actually haven't been playing the Vanilla Reload - Bluebird game (for reasons I'll outline in a future post), but if you do, you may want to get to your nearest source of "ice cream" and stock up! 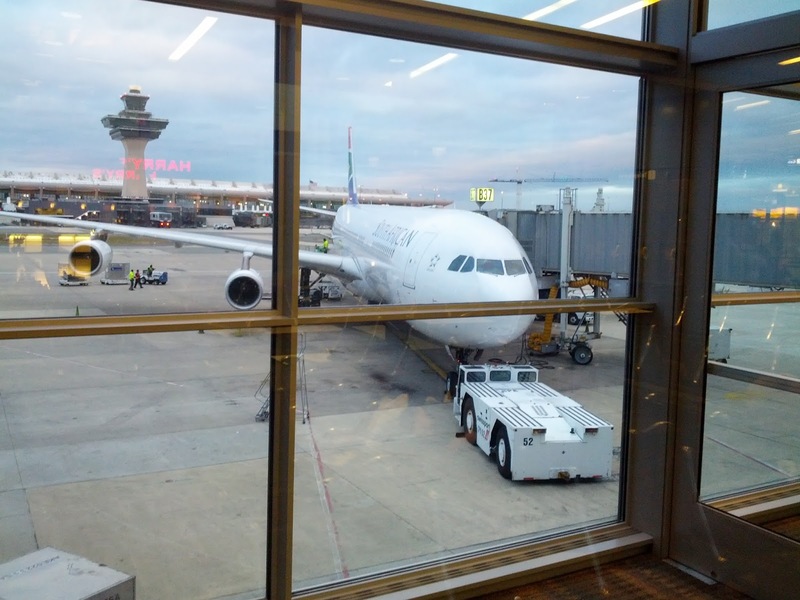 South African Airways (SAA) serves North America on 2 routes: Johannesburg to Washington Dulles (via Dakar, Senegal) and Johannesburg to New York JFK, non-stop. My first trip was on the Dulles route, and I was excited to compare and contrast it to the JFK service - especially since the JFK route is truly a direct flight, and doesn't need to stop to wake everyone up refuel halfway through the trip. 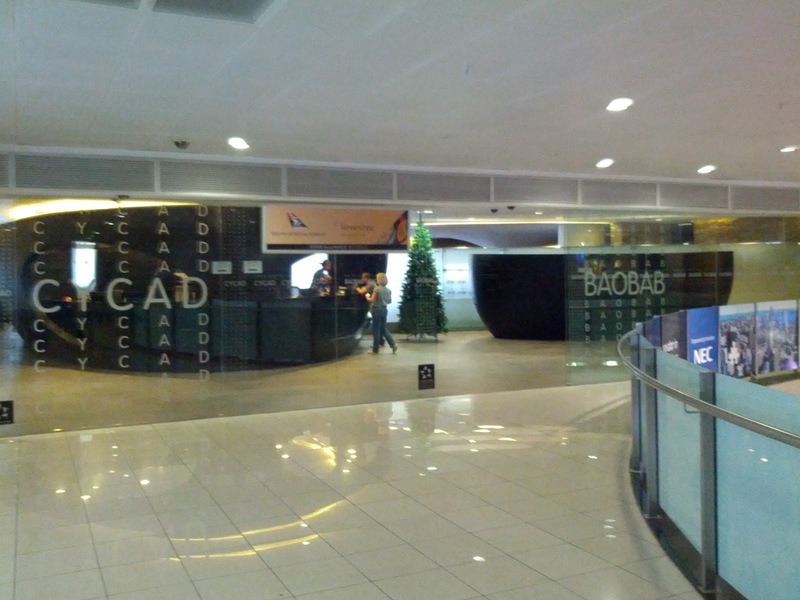 SAA has a large Baobab business class lounge in Johannesburg. While it was very busy, we didn't have any trouble finding a seat with a nice view of the runway. There was hot food available, but I wasn't especially hungry after having eaten on the flight over from Cape Town, and with a multiple multi-course meals ahead of me on the long trip to JFK. That said, I did try the peanut soup and thought it was very tasty. Access to the Baobab lounge is available to passengers traveling in business class, as well as those with Star Alliance Gold status. For more information, you can visit the SAA website. They also have a Cycad first class lounge, which I thought was odd considering that SAA doesn't have a first class cabin on any of their planes. Access to this lounge is reserved for passengers traveling in first class on partners Lufthansa or Thai, as well as top-level elites on SAA and Lufthansa. Full details are available on the SAA website. SAA's JFK route is served with an Airbus A346, a slightly larger plane than the A343 that serves Dulles. More notably, all of the 346s are original SAA aircraft, whereas there are 2 ex-Iberia planes that are rotated into the various 343 routes (including Dulles). We happened to have one of these ex-Iberia planes on the flight over - and while the difference in the 346's seat wasn't dramatic, it was certainly noticeable. 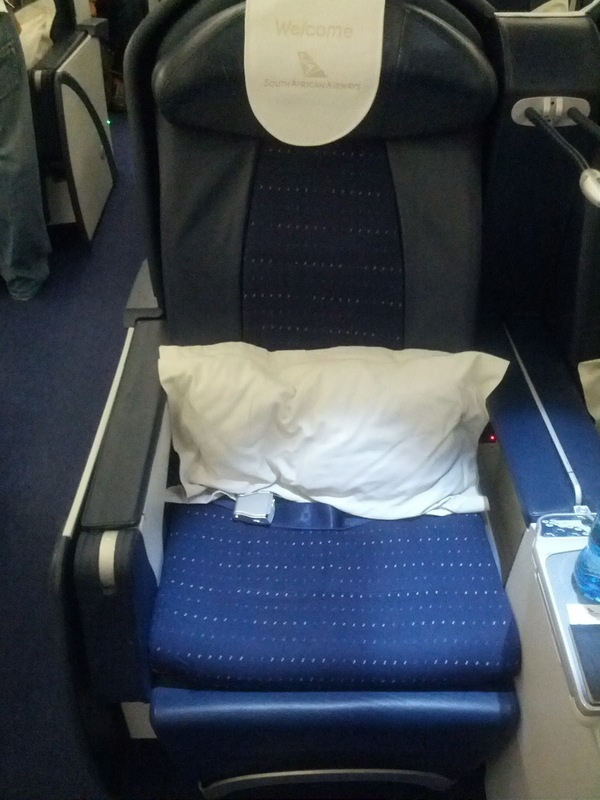 I liked the seat better than the ex-Iberia seats, as it offered a true 180 degree recline, and the transitions were much smoother (the ex-Iberia seats are just the slightest bit shy of 180 degrees, but it is noticeable). That said, I still found it to be pretty hard - I got a lot of sleep, but did wake up a number of times during the flight, in spite of the thin mattress pad that was provided. I actually found the most comfortable position to be just slightly shy of a full 180 degree recline for sleeping purposes. While it isn't as sweet a deal as the Turkish Airlines path to lounge access on domestic United / US Air flights, Air France is offering a match to their Flying Blue's Gold level. Air France is partners with Delta, but unfortunately, having Gold status will not give you lounge access domestically, as SkyTeam doesn't offer that perk. However, it will get you a free checked bag when flying Delta domestically, as well as priority boarding, and lounge access if you're traveling internationally in coach. I haven't flown Delta in a LONG time, but I went ahead and submitted my 1K status on United for the match, because why not? I instantly got the "Congratulations! You are now a Flying Blue Gold Member." notification, but technically they still need to verify my information (and the new status isn't yet showing in my account). If you're someone who flies Delta once in a while, and you have gold status or higher on another airline, then this offer might be of interest to you. You can sign up here. My recent trip to Cape Town was amazing, but unfortunately, it didn't include a safari. While I'm determined to get back to Africa in the coming years, and to see The Big Five on a safari, getting to see what I'll call the "Not-So-Big Five" was still pretty amazing. 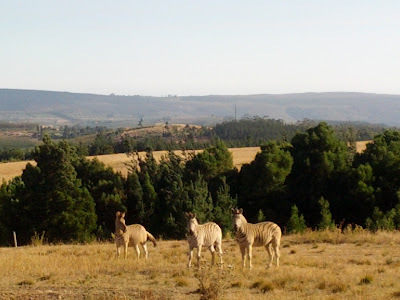 Zebras (pronounced "zee-bras" in North America, and apparently "zeb-ras" in South Africa) were the first wild animal I came across - a nice warm-up, as it was an amazing rush to get close to them, but they still felt very familiar in a way. They're truly beautiful creatures to look at! How Starwood Ruined My Cash and Points Analysis! Come on Starwood, I JUST shared tips on how to use high school algebra to figure out your best redemption option - and now you go ahead and update the entire chart! Yes, Starwood is revising their Cash+Points award chart, effective March 5th. All existing options will require more cash and more points, but they've also added category 1 and category 2 properties, as well as upgraded rooms and suites to the pool. They also talk about the "intention of expanded availability" for standard rooms. That's the key for me - Cash+Points availability has always been pretty limited in my experience. A great score when I can find it, but not something I really expect to be available. If availability does indeed increase noticeably, I could certainly be on board with this. Leading up to my recent trip to Cape Town, I didn't really know what to expect. 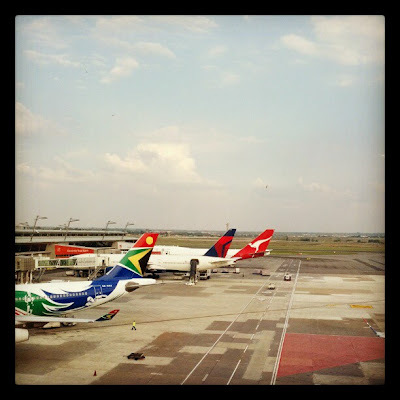 I ended up having an amazing time, including three amazing (and dramatically different) dining experiences, but the only things I'd really taken care of before the trip were the flights (see: Flying South African Airways Business Class From DC to Johannesburg) and the hotels. We ended up spending 6 nights of the trip at the Westin Cape Town (still referred to as the "Westin Grande" to most locals), which is a short walk away from the city's waterfront area. Being a category 4 property, I was thrilled to be able to use cash and points for the entire trip - which as I talked about the other day, is the best option for these types of stays. Having read up on the hotel on Flyertalk, I had a better idea of what to expect, and I'd say my experience was well within expectations. Starwood is my primary hotel program, and mid-level properties are where I often find the best redemption values, as I laid out a few months ago. Stays of exactly 5 nights are also a great option, as the 5th award night is always free. For award stays at category 3 and 4 properties of exactly 5 nights, Starwood's Nights & Flights is also an attractive option, offering 50,000 airline miles in addition to your room redemption. Unfortunately, United is not an option - but you can get AA, BA, Delta, USAir, and many other airlines. See here for full details. Definitely worth a read if you haven't checked it out already - TravelBloggerBuzz featured it as his MVP post of the day! In other words, the only people who follow travel blogs are other travel bloggers. I know this isn't true for the big fish out there, but for us little fish it really got me to thinking... and that thinking led to me to want to find out just how true that might be... and that want led me to create a new reader poll! So how many of you Food, Wine, and Miles readers are fellow travel / points bloggers? Cast your vote in the poll to the right, and let's see how just how true it is! If you are a fellow travel / points blogger, feel free to post a link to your blog in the comments. 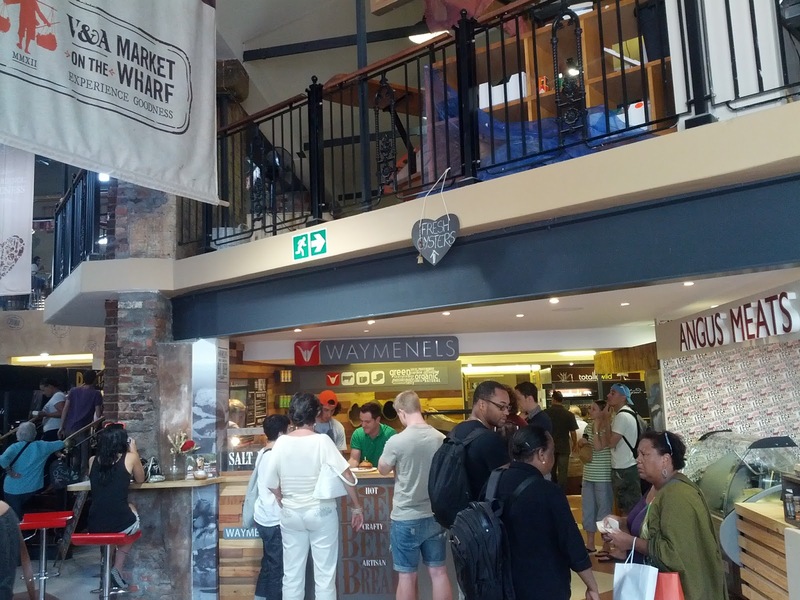 Cape Town's V&A Waterfront is nice to walk around, but most of the food tends to be pretty crappy and tourist-oriented (read: bland and over-priced). 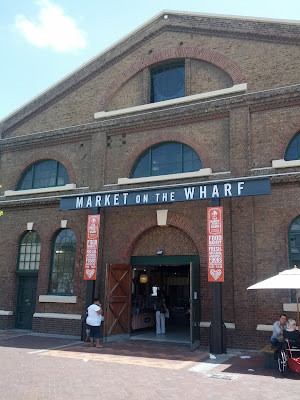 That said, the V&A Market on the Wharf is decidedly different - offering a wide variety of ethnic cuisines, fresh produce, coffee, snacks, etc, etc, etc. It's not a very large space, so the vendors are packed in quite closely. 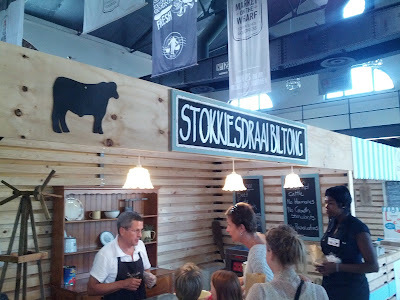 Whether you're in the mood for coffee, breakfast, lunch, or just some Biltong - you can almost certainly find something to satisfy your craving! When in Cape Town, you can't not try the Biltong! If you're more in the mood for fine dining, Cape Town also has a number of great high-end restaurants. One of my favorites is La Colombe. Any way you slice it, getting to South Africa from the US is a long hike. One of the best ways to make the trip (at least from the northeast) is to fly South African Airways, which has a direct flight out of JFK to Johannesburg (JNB) and a "direct" flight out of Washington Dulles (IAD) to Johannesburg (the latter has a refueling stop in Dakar, Senegal about half way through the trip). I recently had the opportunity to try out South African Airways' international business class on the IAD to JNB route. Overall, it was a very enjoyable flight - good food, good wine, and a great value for using miles!